Safety goggles! Exhaust hood or work outside, very toxic vapors and gases leak out! Absolutely avoid contact with benzene, dinitrobenzene and nitrating acid (if possible wear safety gloves and do not breathe in the vapors)! Add 2 ml nitric acid 65% to a test tube, then slowly add 4 ml sulphuric acid 96%, accompanied by water or ice cooling, much heat develops. To the nitric acid add 1 ml benzene. Carefully sway back and forth until the strong warming has somewhat subsided (use the test tube holder!). The nitrogen oxide formed by the disintegrating nitric acid colors the organic phase yellowish or brownish. Now heat the mixture with the burner until it boils somewhat, and then heat repeatedly to this temperature. The hot nitrating acid is extremely dangerous, brown nitrogen oxide rises! In total one warms for at least 2 - 3 minutes. Let the reaction mixture cool and then pour into a beaker filled with plenty of water. The dinitrobenzene settles and soon solidifies into pretty yellow crystals. A marzipan odor indicates unreacted (mono-) nitrobenzene. The diluted nitrating acid is to be disposed of as halogene-free organic waste. The dinitrobenzene can be preserved for further experiments, otherwise it can be disposed of as halogene-free organic waste. If stored then mark clearly (T+!). After the experiment thoroughly clean the test tube and the beaker with acetone or the like and then dispose of the cleaning fluid as halogen-free organic waste. At first (mono-)nitrobenzene is formed (cf. 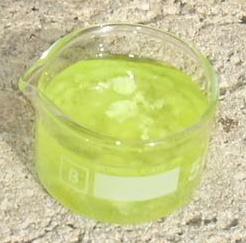 Demonstration of nitrobenzene). Inasmuch as nitrobenzene is still less activated, a further nitration is only successful under sharp conditions (heat). The nitro group deactivates in particular the o- and p-positions of the ring, therefore essentially the m-product is obtained. The reaction mixture at the beginning, benzene floats on top. Nitrogen oxide colors the organic phase brown when the mixture has warmed. Upon further heating nitrogen oxide escapes, in addition the acid is markedly discolored.